In 1915, Wolf Point—a town of 340 residents—voted in favor of incorporating as a municipality. A land rush had brought farmers and ranchers to the area following the construction of the Great Northern Railroad, and permission from the Secretary of the Interior allowed for homesteaders to build on the Fort Peck Reservation for a few dollars an acre. As the area flourished, the need became apparent for a bridge across the Missouri (the nearest crossing being 350 miles away). In 1930, a five-span Pennsylvania through truss was completed at Wolf Point—1,150 tons of steel, 1,074 feet long with a 400 foot span (the longest through truss span in the state). 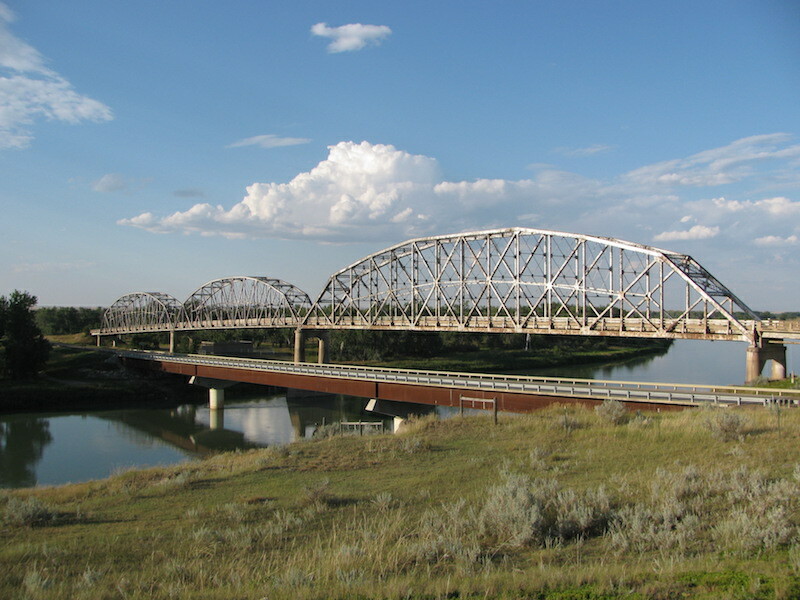 Dubbed the “Lewis & Clark Bridge” (but also known as the Wolf Point Bridge), this engineering marvel spanned Roosevelt and McCone Counties, linking them via Highway 13. It was so impressive that its opening ceremony drew over 10,000 visitors. Though the Lewis and Clark Bridge is no longer accessible to the public today, it is preserved by the Wolf Point Historical Society as an interpretive site for historical events such as the Lewis and Clark Expedition. The bridge is also iconic of Wolf Point’s economic development, having once allowed safe passage to commerce in the south. Nearby, Bridge Park offers a scenic view of the Lewis and Clark Bridge and area wildlife, while also providing access to boating, rafting, and fishing along the Missouri.